Netflix has finally started to film their long awaited series The Defenders. The series will feature their already established characters of Daredevil, Luke Cage, Jessica Jones, and the soon to be introduced Iron Fist. Let me start off by saying that none of the characters in the show, are the original members of the team that appear in the comics. However, all of the characters that will be appearing in the show were considered a Defender at one time or another, with the exception of Jessica Jones. So, if none of those characters were the original members, then who were? Well, the answer, is right on the cover of this issue. 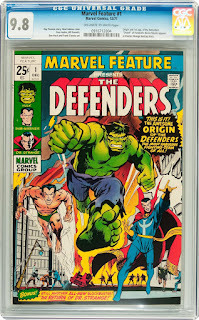 The trio of superheroes is Doctor Strange, Namor, and the Incredible Hulk. Dr. Stephen Strange sits in front of a warm fire at his home, when he hears a voice calling his name. He leaves his physical body and searches for the mystery caller. His search leads him to a hospital, where he recognizes the evil scientist Yandroth, lying in a bed, dying. Before he dies, he tells Doctor Strange about the Omegatron, which is a machine that he built that will destroy the Earth upon his death, a death that he had planned. Strange does what he can to save Yandroth, but fails and the evil scientist dies. Now with little time left, he tries to find help to save the world. The first character he recruits is the Price of Atlantis, Namor. Strange comes across Namor, and tells him of Yandroth's evil plan, and the prince quickly agrees to help. Knowing that the two of them isn't enough, he seeks out one more superhero to help. The Hulk just happens to be close by and Strange pretty much tricks the Jade Giant into helping. In a nutshell, that's how the team comes together. I hate giving away too much of these stories, especially if people want to read it, so I'll end it right there. I will tell you that The Defenders do find the Omegatron and save the the day, in true superhero fashion. I'm just not going to tell you how they do it. Also, the Hulk leaves the team at the end of the issue, just like he did when he was with the Avengers. This is a well known key issue, and in no way under the radar. There are a lot of already graded copies out there. According to the CGC census, there have been 938 copies graded by them. Most of the copies are high grade between 8.0 VF and 9.4 NM. There are some 9.6 NM+ (46) and 9.8 NM/M (11) copies out there too. Since there isn't a census on the CBCS website yet, there's no way of telling how many copies there are out there by them, but there are a handful floating around out there. Values for this comic are up there now, ever since the hype from the upcoming Netflix show, but it's not like it was a bargain bin comic before that. Back in 2012, a CGC 9.8 NM/M copy sold at Heritage Auctions for $1,314.50, and in the same year, the Twin Cities Pedigree 9.8 NM/M copy ended up selling for $1,912. Fast forward to right now, pending sales at Comic Link for the same grade jump up to over the $8,000 mark. There has been a similar trend with 9.4 NM copies. Back in 2012, you could snag a copy for a little over $300. Now you'll be paying over twice that much. A copy sold for $664.44 in March of this year, and the last sale blew up to $925 in July. To say that this is a hot comic would be an understatement. Since this is a hype comic at the moment, I'll expect values to continue to jump up for the time being. I'm pretty sure that once the next hot comic movie news hits, you'll see prices come down a little. How low it goes is beyond me. I guess it will depend if the show is any good or not.